You need to maintain state-level and page-level information of an ASP.NET Web application because Web pages and ASP.NET Framework use HTTP protocol to communicate between a Web browser and a Web server. HTTP is a stateless protocol. Therefore it can not automatically indicate whether the sequential requests are coming from the same or different clients. For example, if you need to develop a Web application that provides a personalized page to users after subsequent logon, you need to keep track of user activities when users access the web page. You need to implement session tracking for each user accessing the Web application because HTTP does not enable you to keep track of user activities in a Web Page. In addition, a Web page is fetched again, each time the page is posted to a Web server. This results in loss of information associated with the page and the controls on the page with each round trip. For example, if user selects a checkbox in a Web page, the selection will be lost in the round trip of the page page. To overcome this limitation, ASP.NET provides different state management options. The ViewState property of an ASP.NET web page enables you to retain page and control-specific values between round trips. Each web page and the controls on the page have the ViewState property that is inherited from the base Control class. ASP.NET framework uses the ViewState property to automatically save the values of the Web page and each control on the Web page prior to rendering the page. During postback of a Web page to itself, one of the tasks performed by ASP.NET is to restore the values in _VIEWSTATE. The view state is implemented with a hidden form field called _VIEWSTATE, which is automatically created in every Web page. When ASP.NET executes a Web page on a Web server, the values stored in the ViewState property of the page and controls on it are collected and formatted into a single encoded string. The encoded string is then assigned to the Value attribute of the hidden form field _VIEWSTATE and is sent to the client as a part of the Web page. When page is initialized during postback, ASP.NET Framework parses the ViewState string to restore the property information in the page. By default, the Viewstate property of both Web page and the controls on the Web page is enabled. Add a label and a button control to Webform1.aspx. The label control and the button control should have the default name, Label1 and Button1, repectively. Ensure that the EnableViewState property of the Label and Button control are set to true. In addition, ensure that the EnableViewState property to the Page is set to true. Add the following lines of code in the load event of the page and execute the application. When the page is first loaded in the memory of the client computer, the message Hello is assigned to the Text property of the label control. However, if you click the button and reload the page, the label continues to display the message. It is because the Text property of the Label control, Label1 is automatically preserved through the view state property of the control..
Now if you set the ViewState property of the label control to false and click the button, the displayed text would not be "hello" but "Label", the default text. The values in view state are stored in a standard HTML format as part of a Web page. Therefore, no Web server resource is required to maintain it. The view state can be easily implemented in the ASP.NET Web page. You just need to set the EnableViewState property of a Web page and server controls. The values in view state are hashed, compressed and encoded for Unicode implementations. Therefore, values in view state are more secured than values stored in hidden fields. Storing large values can cause a page to slow down when user display it or post it because view state is stored in the page. View State is stored in a hidden field in a page. Although view state stores data in a hashed format. It can be tampered with. The information in the hidden field can be seen if the page output source is viewed directly, creating a potential security issue. In ASP.NET, you can use the HTML-standard hidden fields in a Web form to store page-specific information. A hidden field does not render in a Web browser. However, you can set the properties of the hidden field. When a page is submitted to the server, the content of a hidden field is sent in the HTTPForm collection along with the values or other controls. Create a new Web application and add a Text box and a button control to the Webform1.aspx. Add a hidden control onto the form form the HTML tab in the toolbox. Right click the hidden control and select the Run As Server Control option form the short-cut menu. Add a label control to the form. Add the following line of code in the Click event of the Button control. When the application is executed and you click the button after entering any text in the text box, the entered text id assigned to the Value property of the HtmlInputHidden control. During the round trip of the Web page, the value remains stored in the HtmlInputHidden control. At the time of loading the page, the value stored in Hidden1 is assigned to the Text property of the Label1. INtersetingly, when a user clicks the button wothout specifying the value in the text box, label1 displays only the text Hidden Value without any additional text. This is because the value of the text box is always assigned to the hidden variable. In addition, when the page loads for the first time, Page.IsPostBack will return false. Therefore, the text Hidden Value will not be displayed. Note: If you use hidden fields, you must submmit your pages to the server using the HTTP POST method instead of requesting the page using the page URL. You cannot take advantage of hidden fields if a page is processed in response to a link or the HTTP GET method. The hidden field can store page-specific information without accessing any Web server or Web browser resource. The hidden field can be easily implemented in an ASP.NET wweb form page. You can view the information stored in the hidden field by accessing the source of the Web page. Therefore, the values stored in hidden form fields are not very secure. The hidden field does not support more than a single value field to store information. The hidden fields are stored in a page. Therefore, storing large values in hidden form fields can slow down the processing of the page. Cookies are saved on the Client computer. Cookies can either be temporary or persistent. Temporary cookies, also known as session cookies, exist in the memory space of a browser. When the browser is closed, all session cookies added to the browser are lost. A persistent cookie is saved as a text file in the file system of the client computer. A Web browser can access a cookie from the HttpCookieCollection by using the Request object. If a cookie is accessed using the Request built-in object, the cookie is a read only file. The cookie is stored on the Web browser and not on the Web server. However, if you want to modify a cookie, you need to use the Response built in object. Create a new web application and add a button control to the form. Add the following lines of code in the click event of the button control. When you execute the application, only a button is displayed in the Web browser. After you click the button in the web form, a cookie with the name Cookiename is created in the Cookies folder on the client computer. After the cookie is created on the client computer, the details of the cookie, such as the name and the expiry date of the cookie are displayed in the client browser. A cookie is stored on the client computer and can be read by the server after a request for a page is posted. Therefore, no server resource is involved in maintaining the cookie. A cookie is a text-based data structure that contains key value pairs. Therefore, it is easy to create and manipulate cookies. A cookie can either expire when the browser session ends or exists indefinitely on the client computer, subject to the expiration rules on the client. Cookies that are stored on client computers have a limited size. Most browsers allow cookies to have up to 4096 bytes in size. Therefore, you cannot store a large amount of data in a cookie. Users can disable cookies to prevent them from being stored on the hard disk of their computer. If a user denies permission for cookies, an ASP.NET Web application cannot store cookies on the client computer. Note: The above stated limitations of cookies are overcome in ASP.NET by means of cookie-less property. If you set the cookie-less property to TRUE, ASP.NET will embed the session id, normally stored in the cookie, into the URL that is sent back to the client. When the client makes a request using the URL containing the session id, ASP.NET is able to extract the session id and map the request to the appropriate session data. If you need to submit information back to a Web page or another page by using a URL, you can use a query string. The query string is part of the request that appears after the Question mark (?) character in the URL. A query string provides a simple way to pass information from one page to another. 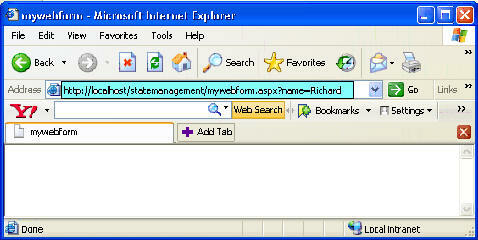 For example, in a logon screen, the user name can be passed to the next page in the application by using query strings. In an ASP.NET Web application add one TextBox control and specify the ID property as txtusername. Add one label control to indicate the type of value the user needs to enter in the TextBox control. Specify the Text property of the Label control as Enter username. Add another label control to display an error message when the user does not enter any value in the TextBox control. Specify the ID of the label as lblmsg. Delete the default text property of the control. Add a Web form to the project by using the Add Web form option from the project menu. Name it a mywebform. Add a button control to WEbForm1.aspx and set the text property value as Submit. Add the following lines of code in the click event of Button1. //The HttpUtility class provides methods for encoding and decoding URLs when processing Web requests. In the above code, the Redirect method of the Response object is used to redirect the execution of the Web application form WebForrm1.aspx Web page to mywebform.aspx. The UrlEncode method of the HttUtility class is used to pass the string entered in the txtusrname text box from WebForm1.aspx to mywebform.aspx in an encoded format. Therefore when user enters a username in the textbox control, the value that the user has entered is passed to the mywebform.aspx web page as part of the URL. A query string is contained in the HTTP request for a specific URL. Therefore, no server resource is involved to process a query string. Many Web browsers support passing values in a query string. Therefore, if you create a Web application that passes information from one page to another using a query string. The information in a query string is directly visible to the user in the browser window. Therefore, you need to encrypt this information to ensure that any confidential information is not exposed to strangers. This causes an additional overhead to Web application development. There is a limit to the amount of information that you can pass from one page to another using query strings because most browsers support up to 255 characters of URL. ASP.NET provides Application state as a means of storing application wide-specific information such as objects and variables. The information in the application state is stored in a key-value pair and is used to maintain data consistency between server round trips and between pages. It is important to note that after an object is added to an application state, it remains in the application state until the application is shut down, the Global.asax file is modified, or the item is explicitly removed from the application state. The memory occupied by variables stored in an application state is not released until the value is either removed or replaced. Therefore, the number of variables and objects in an application state should be minimum. Otherwise, it will be an overhead on the Web server and the server response will be slow. Multiple pages within an application can access values stored in an application state simultaneously. Therefore, explicit synchronization methods need to be used to avoid deadlocks and access violations. This event is triggered when an application starts. If you want a code to be executed as the application starts, you should add it to the Application_Start event. This event is triggered only when the application starts and is not triggered again until the IIS is stopped, the Global.asax file is modified, or the application is unloaded. Multiple pages within an ASP.NET Web application can simultaneously access values, stored in an application state. This can result in conflicts and deadlocks. For example you can add a variable named PageCounter in the application state to keep track of the number of times a page has been requested. If two users access a Web page simultaneously, there will be an attempt to update the value of the variable PageCounter simultaneously. This will lead to a problem. To avoid such situations, the HttpApplicationState class provides two methods, LOCK ( ) and UNLOCK ( ). These methods only allow one thread at a time to access applications state variables and objects. Note: Each browser request for a Web page initiates a new thread on the Web server. Calling the Lock ( ) method on an Application object causes ASP.NET to block attempts by the code running on other worker threads to access anything in an application state. These threads are unblocked only when the thread that called the Lock ( ) method calls the corresponding Unlock ( ) method on the Application object. In the preceding example, the Lock() method is first called to ensure that the variable PageCounter cannot be simultaneously modified by another thread. Next, the counter is increased by 1 and then the value is displayed in the browser window. At last, the UnLock() methods is called to release the imposed lock on the application state variable PageCounter. You can notice the effect of Lock() and UnLock() methods by clicking the Refresh button on the browser window. Each time you click the Refresh button, the value of the PageCounter is incremented. You can open the same form in another window by copying and pasting the URL, you will note that the value displayed will be not 1 but 1 incremented to the value you left on the previous window. Note: If you do not explicitly call the Unlock( ) method, the .NET Framework automatically removes the lock when the request completes or times out, or when an unhandled error occurs during request execution and causes the request to fail. This automatic unlocking prevents the application from deadlocking. You cannot selectively lock items in an application state, the application state object as a whole is blocked. Application state is easy to use and is consistent with other .NET Framework classes. Storing information in application state involves maintaining only a single copy of information. The data stored in an application state is lost when the Web server containing the application state fails due to a server crash, upgrade, or shutdown. Application state requires server memory and can affect the performance of the server and the scalability of the Web application. In ASP.NET, session state is used to store session-specific information for a Website. Unlike application state, the scope of session state is limited to the current browser session. If different users are accessing a Web application, each will have a different session state. In addition, if a user exits and returns later, the user will have a different session state. Identify and classify requests coming from a browser into a logical application session on the server. Store session-specific data on the server for use across multiple browser requests. Raise session lifetime-related events, such as Session_OnStart and Session_OnEnd, which can be handled using application code. Any variable or object that you add to a session state is available only until the user closes the browser window. The variables and the objects are explicitly removed form session state if the user does not requests a page for more than 20 minutes. Any variable or object added to a session state is related to a particular user. For example, you can store different values for myvar for two different users accessing the Web page and each user can access only the value that is assigned to him. Any object that supports serialization can be added to a session state. Since objects stored in a session state are stored on the server, session objects are not subject to the same size limitations as cookies. Similar to he application state you can remove a variable added to the session state by using the Remove ( ) or RemoveAll ( ) method. You can also modify the Timeout property of the Session object to change the default value of timeout i.e. 20 minutes. You can capture both these events by adding subroutines in the Global.asax file. A practical demonstration in the end of this article would make the usage of these events more clear. You can also use the Session_Start subroutine to automatically redirect users to a particular page when a user session begins. Create a new ASP.NET web application. Search the ASP.NET State service and click the Start Service button. Modify the web.Config file to set the sessionstate mode to the value StateServer and specify the location of the State Server in the stateConnectionString. When the State Server is used to store the session state data, the process mode is InProc ( in-process), by default. You can also manage session state out of process by storing data in a Microsoft SQL Server database. The advantage is that you can cluster multiple database servers so that if one fails, another can take over the state management. For this change the mode property of sessionState in Web.config to SQLServer. It is event driven, therefore you can use session events to perform conditional execution of user-defined tasks. data in session state variables and objects can survive Web server restarts without losing data. Session states can be used in both multi-computer and multi-process configurations. A session state facility can work with browsers that do not support HTTP cookies. Session state variables are stored in memory until they are either removed or replaced. This can degrade Web server performance. Here we'll build a simple page that resembles some of the characteristics of a shopping cart. It will show number of items in the cart which may vary according as per every user who's logged on to this page. We will also have a button to remove items from the cart. I have kept it simple, and I am just counting the number of items in the cart, you can do this by assigning the value to the session variable as a DataSet or an Arraylist. For the sake of your learning I will also show you the usage of application state and the session events. You can download example project from this link . This application keeps a track of the number of users who have visited the site. Had you wanted to keep a track of just the active users, you could have added the following line of code to the Session_End event.